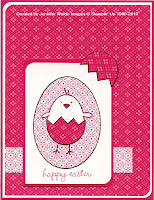 I wanted to play along with the Stamping 411 sketch of the week, so I chose an Easter set I haven't used much, A Good Egg, and a new (to me) pack of Patterns Melon Mambo DSP. This set works well with, and actually seems to need paper piecing for the proper dimension! Card base is Melon Mambo with a close layer of Whisper White than a background of Patterns Melon Mambo DSP in one of the "Melon" prints. The upper left & bottom right are rounded per the sketch. Same on the layers for the main image, the upper left & bottom right are rounded. For the main image, I stamped the large oval "egg" on both the Whisper White and a "white" print of the DSP. I cut out the DSP egg & and stamped the chick image in black on it, and on a "melon" print and a piece of Whisper White. I cut out the chick from the White and the egg shell from the "melon" print. I cut a second shell from the Melon DSP for the top right corner accent piece. I layered together the chick and grabbed my Melon Mambo marker to trace around him for accent. The 'happy easter' was added under the egg, using the Stamp-a-ma-jig for proper placement. A small strip of "white" print DSP was added behind the focal image layers. Happy Thursday all! Hoping for a productive day here around the house, but not betting on it!!! Super cute melon mambo Card! Great ideas and awesome job with the sketch. Very cute...I absolutely love that stamp set, yet have never bought it! I just know it will retire if I get it...lol! Great job with the Stamping 411 sketch this week! Super cute! Love the eggshell for that element! Thanks for playing along this week!